Lenovo-owned Motorola recently introduced the third generation model of its best-selling smartphone, the Moto G. The first iteration of the smartphone was the company’s debut device in India when it entered the country again after closing its shops in 2011. The device brought impressive hardware along with the latest Android experience at that time. Now the Moto G (3rd Gen) model brings some serious improvement over its predecessor at a competitive price tag. However, Indian market is flooded with several devices from Chinese vendors, which offer impressive set of hardware at competitive pricing, from which the Moto G (3rd Gen) will have to face stiff competition. China-based Xiaomi’s latest smartphone in India, the Mi 4i is one of these phones. 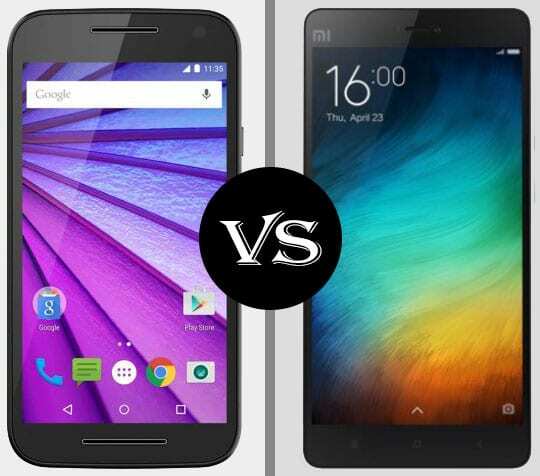 If you have been eyeballing the Moto G (3rd Gen) or the Xiaomi Mi 4i, let’s compare their specs to help you decide. Talking about the Moto G (3rd Gen) first, the phone comes with a premium design featuring a metal frame and a metal vertical strip at the back, sporting the rear camera and LED flash. It is one of the affordable phones in India in its range to offer a waterproof body that can survive up to 30 minutes under three feet of water. As far as the dimensions are concerned, the Moto G (3rd Gen) measures 11.6mm around the waist and weighs 155 grams. Coming to the Xiaomi Mi 4i, this one offers a polycarbonate casing, which feels extremely good in hand. Also, measures 7.8mm around the waist and tips the scale at 130 grams. Overall, on the design front, the Moto G (3rd Gen) and Xiaomi Mi 4i offer impressive build quality and eye-catching designs. The Mi 4i is quite lean and much lighter than the Moto G (3rd Gen). However, the latter has advantage of waterproof body over the former. 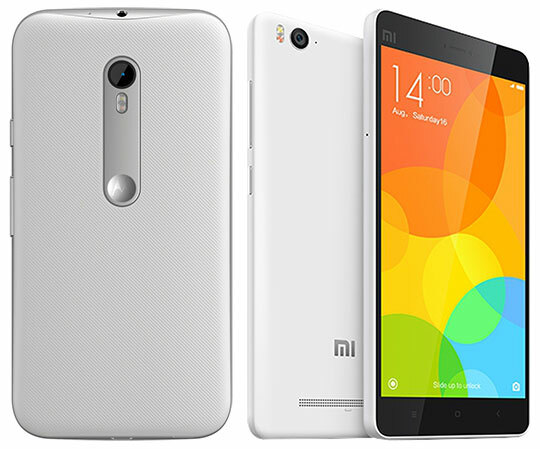 The Moto G (3rd Gen) and Xiaomi Mi 4i, both offer 5-inch IPS LCD displays. However, the Mi 4i offers better colour reproduction and media viewing experience with its full HD screen panel, and offers a high pixel density of 441ppi. The Moto G (3rd Gen) only offers an HD screen with a pixel density of 294ppi. On the software side, the Moto G (3rd Gen) runs the latest Android 5.1.1 Lollipop that is close to the stock version, and also has a few unique software tweaks like Moto Display, Quick Capture and Chop Twice. The Xiaomi Mi 4i also runs Android Lollipop, but a bit old version i.e. 5.0. It doesn’t offer untouched vanilla experience since the phone has an overlay of MIUI 6 custom UI on Android. However, the MIUI 6 custom ROM also has some interesting software tweaks. The Moto G (3rd Gen) is powered by a 64-bit 1.4GHz quad-core Qualcomm Snapdragon 410 processor, aided by 2GB of RAM and an Adreno 306 GPU. The Xiaomi Mi 4i on the other hand utilizes an octa-core 64-bit Qualcomm Snapdragon 615 processor that has two quad-core clusters of 1.7GHz and 1.1GHz, coupled with 2GB of RAM and an Adreno 405 GPU. Since the Mi 4i is backed by an octa-core CPU, it clearly offers better performance than the Moto G (3rd Gen). For storage, both smartphones offer 16GB of internal memory. However, while the Moto G (3rd Gen) has a microSD card slot to expand the storage further, the Mi 4i lacks it, but there’s also a 32GB model of the phone. The Moto G (3rd Gen) and Xiaomi Mi 4i offer similar camera specifications. They offer 13-megapixel primary cameras with dual-colour LED flash and full HD video recording, and 5-megapixel secondary shooters for selfies and video calls. The first and second-gen Moto G were criticized for not having 4G LTE networks support, but the latest-gen variant is a 4G-enabled offering. Connectivity-wise, the Moto G (3rd Gen) and Mi 4i, both offer dual-SIM slots, 4G, Wi-Fi, Bluetooth, micro-USB, and A-GPS. Both have support for Indian 4G LTE bands. The Moto G (3rd Gen) is fuelled by a 2,470mAh battery, and the Mi 4i is backed by a bigger 3,120mAh unit. So it’s quite clear that the Mi 4i offers better battery backup than the Moto G (3rd Gen). 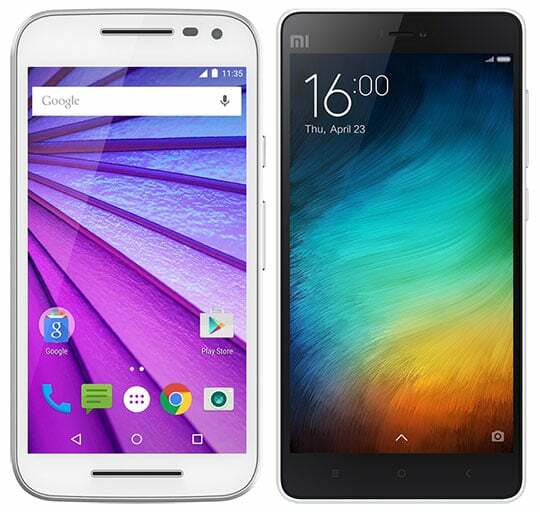 The Moto G (3rd Gen) and Xiaomi Mi 4i are among the best devices priced at Rs. 12999.00. They offer excellent design, 4G LTE support, decent camera features, solid internal storage, 64-bit computing, and the latest Android experience. The Mi 4i is slimmer than the Moto G (3rd Gen), and offers better performance, battery, and a full HD display. However, the Moto G (3rd Gen) is an all-weather device with a waterproof body, so the choice is yours. The above article on Motorola Moto G (3rd Gen) Vs Xiaomi Mi 4i is written by Pooja Sharma from 91mobiles.com, which is a comprehensive Mobile phone portal for Indians. One can find latest Mobile phones, best deals on mobile phones, their reviews and even videos related to each and every phone model and can do Online Mobile Shopping. The site aggregates content across major online retail stores, mobile blogs, press-release agencies and news sites and presents the information in an easy-to-understand format. Follow her on Twitter.